The simple box has a shallow lid and was soldered shut. Etched into the underside of the lid is the name E. Miller, likely Edward Miller, who was one of Brashear’s employees who made optical instruments and likely fashioned the box. Heinz History Center Collections, L2015.50. Photo by Liz Simpson. 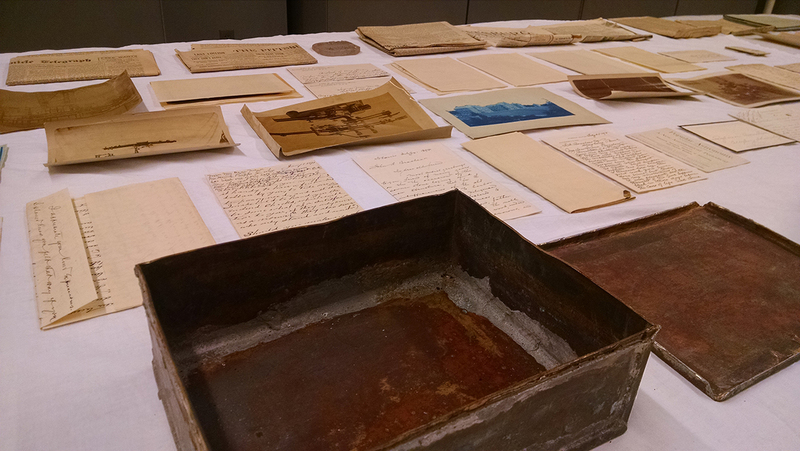 The complete contents of the time capsule were carefully unpacked and documented in the Grace M. Compton Conservation Lab upon their arrival at the History Center. Heinz History Center Collections, L2015.50. Photo by Liz Simpson. August 14 marks the anniversary of the day in 1894 when astronomer and instrument maker John Brashear, along with a group of his employees, placed a small time capsule box in the cornerstone of their workshop building in Observatory Hill. More than 120 years later, on March 24, 2015, as workers from the Jadell Minnifield Construction Company demolished the last wall of the John A. Brashear Astronomical & Physical Instrument Works at 2016 Perrysville Ave. in the North Side, that same metal box appeared in the wreckage. It contained nearly 60 documents, photos, and objects. The contents were carefully assembled by Brashear after the building was completed. 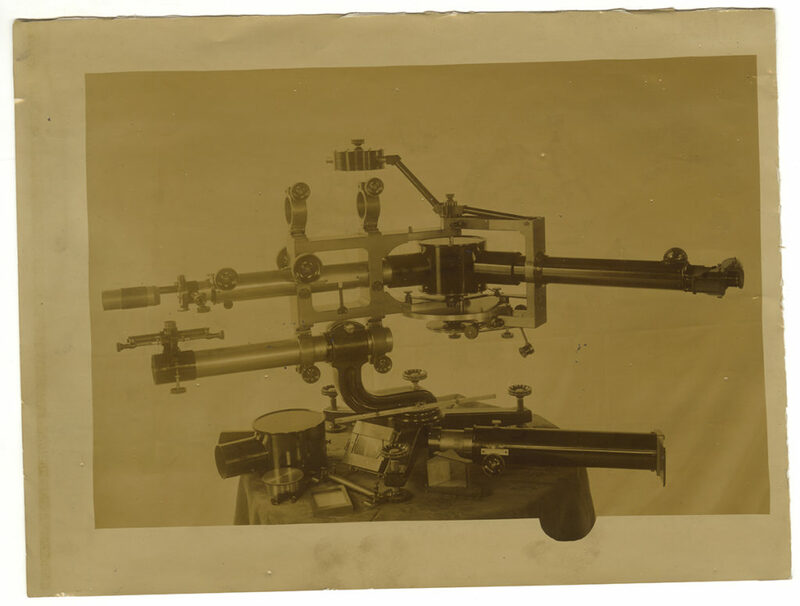 Brashear was largely self-taught in his profession and his desire for perfection led him to be recognized as one of the best optical instrument makers in the country. The contents of the time capsule he assembled are much more than a simple record of the man, his business, or the times. They provide us with an intimate look at Brashear’s career and personal life, documenting the people who helped him achieve his dream of building scientific instruments to explore the stars. John Brashear came of age as a scientist and inventor as the discipline of science emerged in America. Many noted inventors of his time, from George Westinghouse to Thomas Edison, had no formal schooling. They were tinkerers or mechanics whose observation and exploration of the physical world, matched with a creative and questioning mind, led them to new ideas. While working as a millwright on the South Side, Brashear and his wife, Phoebe, began building their own lens and telescope during their free time. 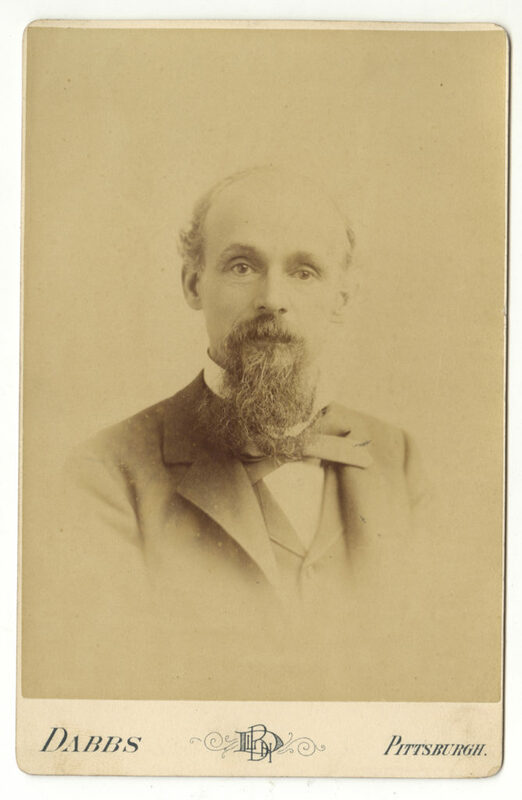 Cabinet card of John Brashear. On the back, Brashear writes, “The ‘Governor’ or ‘Pa’ as the boys of the shop call him. At the building or rather laying of this corner stone he is 53 years 9 months and 20 days old. August 14, 1894.” Heinz History Center Collections, L2015.50. Cabinet card of Phoebe Brashear. 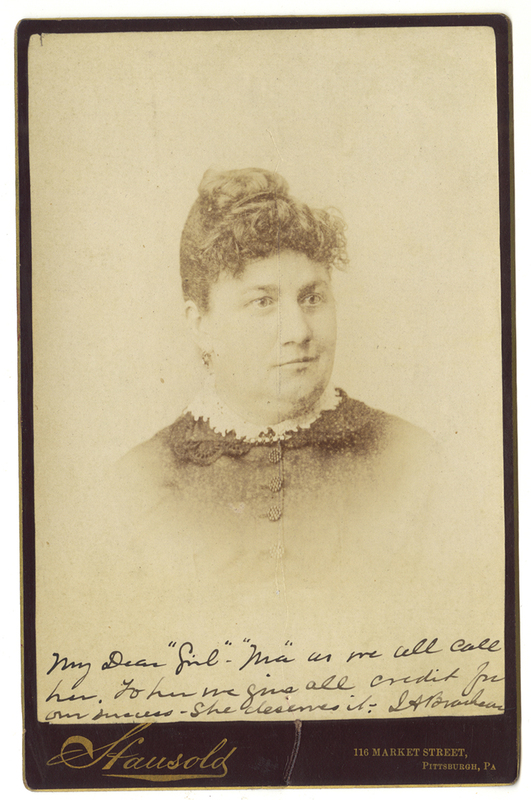 On the front of the image Brashear writes, “My Dear ‘Girl’ — ‘Ma’ as we all call her. To her we give all credit for our success—she deserves it. JABrashear.” Heinz History Center Collections, L2015.50. More than just an amateur attempt, the high quality of Brashear’s first lens greatly impressed Langley. As a result of that meeting, Brashear was introduced to the larger scientific world and several wealthy patrons of the sciences that allowed him to begin working on astronomical instruments full time. With his love of the stars and mechanical problem solving skills, Brashear built some of the finest optical instruments ever made, many of which are still in use today. He began working on astronomical devices full time in 1881, and by the 1890s, astronomers and scientists throughout the world were using his lenses, mirrors, telescopes, and scientific tools to make countless discoveries. Letter dated October 11, 1874, from Samuel P. Langley to Brashear in response to a question he asked about the curves of the first five-inch lens that he and his wife made. 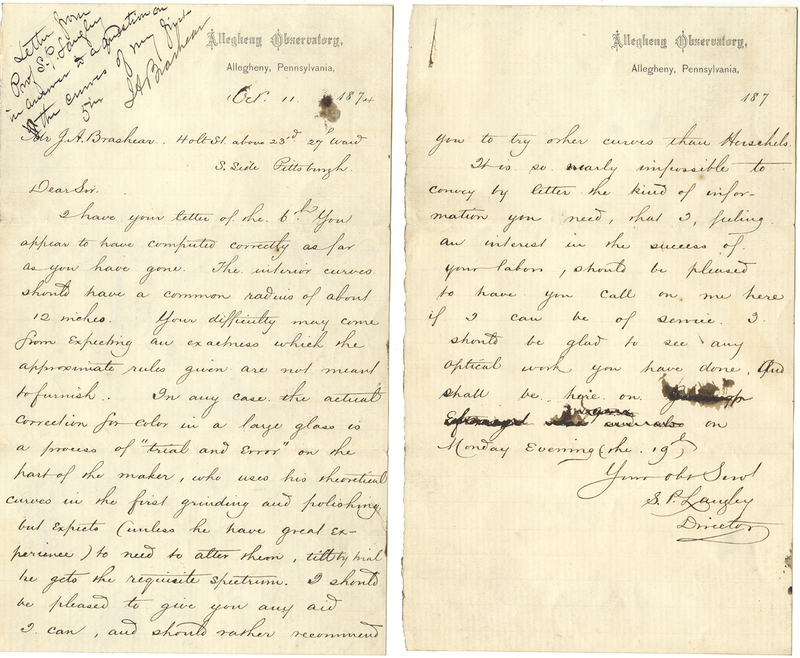 Langley writes that “I, feeling an interest in the success of your labor, should be pleased to have you call on me here if I can be of service. I should be glad to see any optical work you have done.” This may very well be the first piece of correspondence between these two men whose work would be intertwined for decades. Heinz History Center Collections, L2015.50. The letters, photographs, and ephemera in the time capsule give rare insight into the people that John Brashear held dearest in his life and work while also demonstrating the breadth of his impact on Pittsburgh and the scientific world. To Brashear, the memories of “his friends in this profession are to-day treasures of greater worth than gold or precious stones.” We are fortunate that Brashear decided to place so many pieces of his life into this box so that one day others might learn from and be inspired by his accomplishments. As Brashear writes in a letter that was found at the top of the time capsule, “I hope when I’m gone that these pieces will never be forgotten by those in whose hands I leave it.” With this time capsule, his legacy and desire to share his knowledge of the beautiful world in which we live is now firmly preserved at the History Center. Letter written by John Brashear on Aug. 14, 1894, that states his wish “that every piece of work shall be made as perfect as human hands and human brains can make it, no excuse ever to be made for imperfect work. I hope that when I am gone that these precepts will never be forgotten by those in whose hands I leave it.” It was Brashear’s desire for and ability to achieve perfection that made his products so valuable to scientists. Heinz History Center Collections, L2015.50. 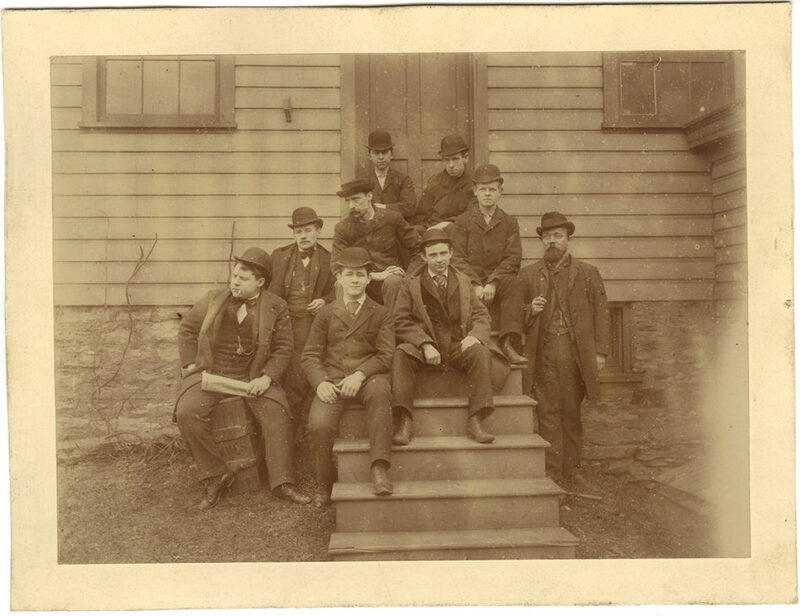 Albumen print of the employees of Brashear’s Mechanical Department, Aug. 1894. Written on the back are the names of the men, all makers of telescope mounts, tubes, dials, and focusers. The text reads, “With the best wishes for success and a long and useful life to our employer, and The hope that this building shall stand for many generations, serving the purpose for which it is being erected, The Advancement of science, We deposit our names into this cornerstone.” Edward Miller, the creator of the time capsule box is seated on the left at the top of the steps. Heinz History Center Collections, L2015.50. 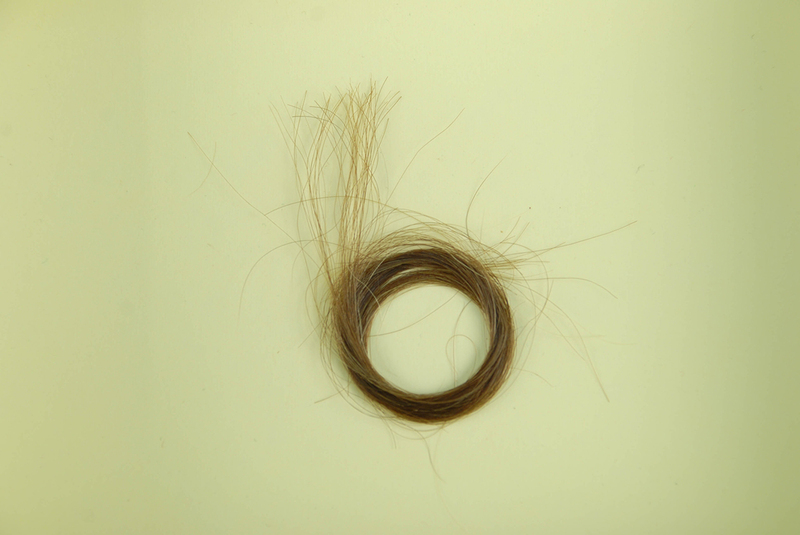 Also included in the time capsule is a lock of Phoebe’s hair and on the envelope Brashear writes, “It was she who stood by me through the darkest hours and whose good cheer & helping hands and loving sympathy were prime factors in my success.” Heinz History Center Collections, L2015.50. Photograph of a standard spectroscope made by Brashear. Spectroscopes are used to measure light in order to help identify component materials of an object in space. The new field of astrophysics created many customers for the Brashear factory. Instruments could be ordered from a standard catalogue or custom made to meet the customer’s specific needs. Heinz History Center Collections, L2015.50. 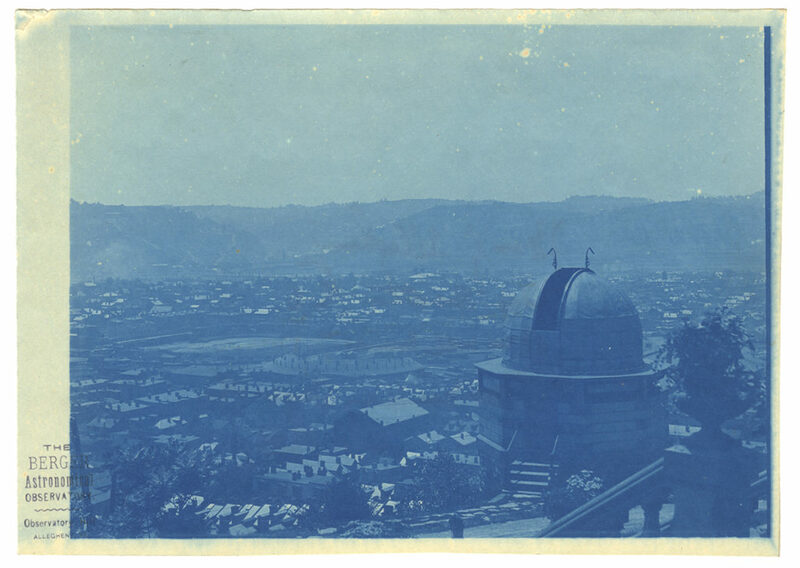 Cyanotype of Berger’s Observatory with a rare view of Recreation Park ballpark visible as a field in the background at left. Henry Berger lived near Brashear who created a lens and other accessories for his telescope. Heinz History Center Collections, L2015.50. This small, rough piece of glass has “#16 Flint Macbeth” etched on the front. 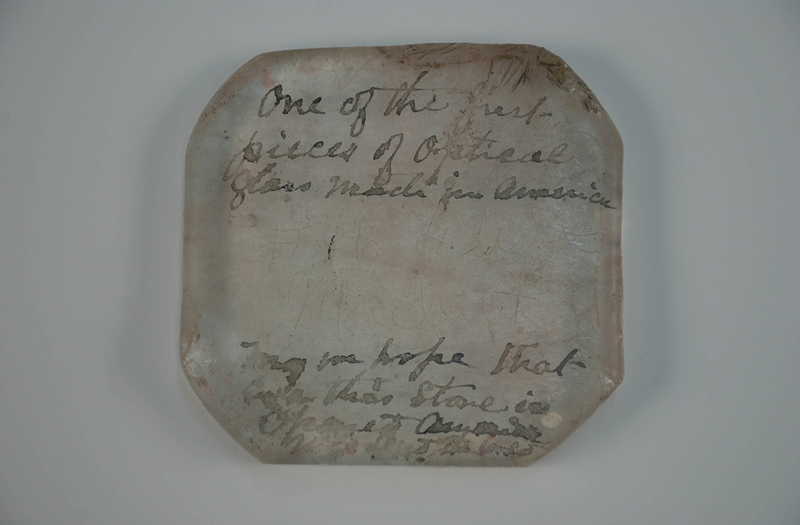 The inscription in ink is difficult to decipher but it appears to read, “One of the first pieces of optical glass made in America. May we hope that when this stone is opened America will lead the world.” Obtaining quality optical glass became one of the main challenges Brashear faced in making lenses. Much of what he used had to be ordered from Europe, so the glass took months to arrive and was often damaged in transit. This piece is likely from a factory opened by George Macbeth, a Brashear friend, in 1891. Heinz History Center Collections, L2015.50. Photo by Liz Simpson. 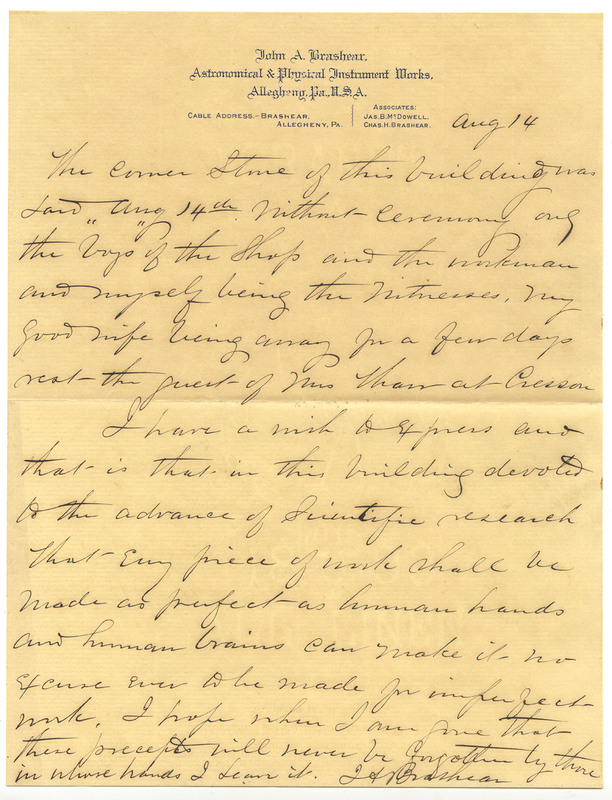 Letter from Samuel P. Langley on Smithsonian Institution letterhead, dated July 19, 1894. 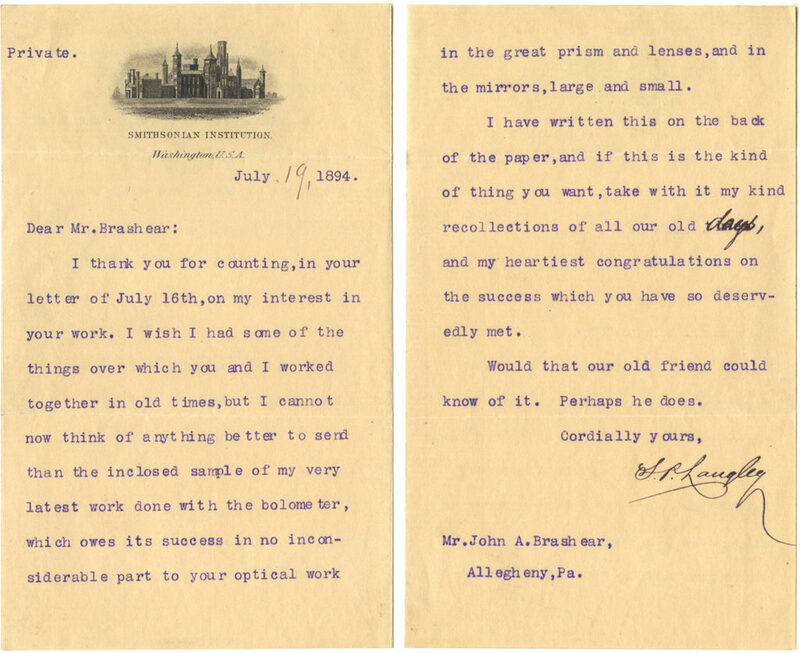 Brashear received this letter to be placed in the time capsule almost 20 years after first writing to Langley for advice. Langley became the third Secretary of the Smithsonian in 1887, splitting his time between Washington, D.C., and the observatory in Pittsburgh. For three years, Brashear assisted Langley’s investigations into the laws governing flight by making the mechanical apparatuses that he used in his testing. Heinz History Center Collections, L2015.50. Visit the Pittsburgh: A Tradition of Innovation exhibition on the History Center’s second floor to see the time capsule box and some of its contents. 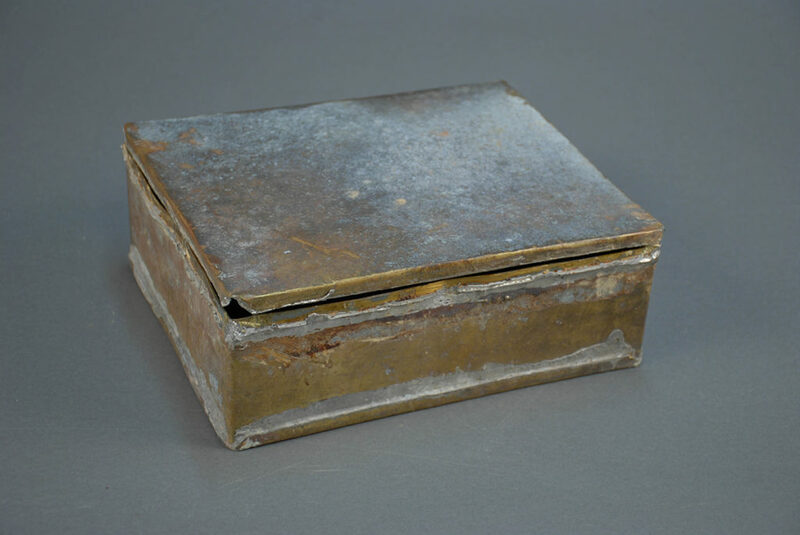 You can also read the full article about John Brashear and the contents of the time capsule in the Summer 2016 issue of Western Pennsylvania History. John A. Brashear and William Lucien Scaife, ed., John A. Brashear: The Autobiography of a Man Who Loved the Stars (Pittsburgh: University of Pittsburgh, 2001), 131. Liz Simpson is the assistant editor of Western Pennsylvania History Magazine and assistant registrar at the at the History Center. A fine article. Well done. He had little education but yet achieved a lot.